I once again am behind the curve. Work and few other things have been keeping me away. I had a new 8 & $20 go up on WineSpectator.com a few weeks ago and I haven’t even gotten around to sharing it. This one is special to me too because it’s based on a favorite Venezuelan dish–Arepas with Venezuelan Chicken Salad. We love this salad, so we didn’t really change up the leftovers too much. We pretty much had it as a salad, in sandwiches, or in wraps each time. 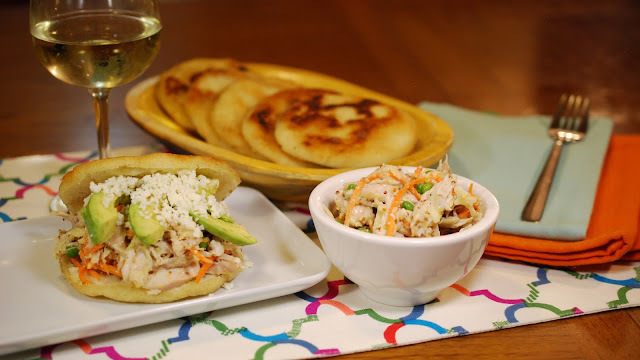 Sometime ago, I shared a video on how to make arepas in this post. It’s pretty easy, but you might find this helpful if you’re making them for the first time.